« Why won’t my Achilles’ heal? Ken Bob Saxton is the man. 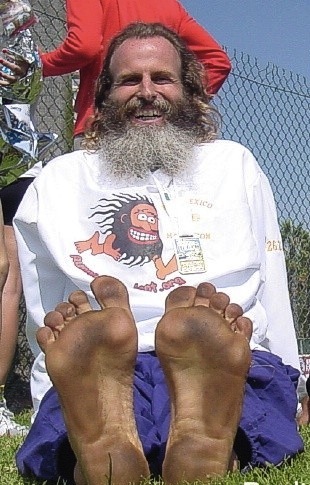 According to Wikipedia, Barefoot Ken Bob is the Godfather of barefoot running, and that’s consistent with my experience. I am one of the countless rookie runners BKB has gone out of his way to advise. He’s a busy guy, but he took the time to respond twice to my post on Sunday. Normally a very patient teacher (ala the Shoalin priests in Kung Fu) he bristled at me a few weeks ago when I too readily concluded that winter barefoot running in New England doesn’t work. “Open your mind,” said KB. I did, and was out running in 15 degrees a week later. The only time BKB really loses it is in response to the cardinal oxymoron: barefoot running shoes. Barefoot means barefoot. His madness is not without method. His most consistent theme is that your own bare soles are your best teachers. “Listen to your feet,” is classic Ken Bob. This view reminds me a lot of Tim Gallwey‘s great books from the 70s on tennis and skiing. Gallwey’s premise is basically that our bodies learn how to ski or hit a tennis ball from watching other people…and then our brains screw it all up. He tells you to feel your shins on the tongues of your boots or the angle of the racket in your hand, and don’t think so much. If you can believe your body knows how to ski, it’s easy to buy that it knows how to run. Ken Bob tells you listen to your feet and your body, and you’ll do the right thing. Some of his advice, reminds me of the ol’ joke: Doc, it hurts when I do this….Then don’t do that. BKB’s downhome wisdom is similar. If your feet are getting sore, stop running. Take it easy. Be patient. Barefoot Running is the best single reference there is. Check it out. When I ski or play tennis, Gallwey’s lessons in the back of my head. And when I run BKB is always whispering, “Relax, relax, relax.” Do I have it right, BKB? Thanks. This entry was posted on February 23, 2010 at 9:59 pm and is filed under Barefoot Running, Other Runners, Research. You can subscribe via RSS 2.0 feed to this post's comments. You can comment below, or link to this permanent URL from your own site.